Notes: Interesting post war austerity microcar. Manufactured by Borgward in Bremen, Germany. 600cc air-cooled twin. 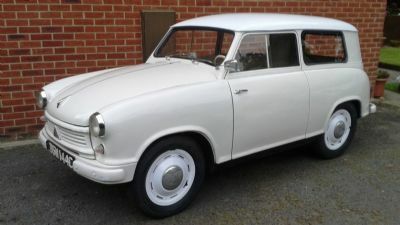 Imported into the UK in 1965 and then stored / unused for the next 35 years. Recommissioned approximately 16 years ago. Despite at one time being the second largest volume manufacturer in Germany - after VW - these days Lloyds are now a very rare sight. Indeed this is believed to be the sole surviving LS (Kombi-Wagen) model left in the UK! When did you last see another? Fate: Sold to a Mr. G Hauschild, and repatriated to Germany. Modifications: None. All standard - and very basic!